Event though very much already works reasonably well, there are still some glitches. So, please don’t expect a 100% working system. We released this as testing version in order to get more feedback and with the hope that others may also contribute to the Mer Nexus 7 hardware-adaptation as well. To see the installation instructions read on. Please be warned that, by following the instructions stated here, you will lose the warranty on your Nexus 7. Furthermore, you might damage or destroy your Nexus 7 or even worse. You do all the things described here on your own responsibility. You can get the current version of Plasma Active for Nexus 7 including the MOSLO here. You will need the “plasma-active-*.tar.bz2” as well as the “moslo-nexus7-*.tar.gz” files. The “*.ks” file is the file that was used to create the rootfs tarball (“*.tar.bz2”). In order to install Plasma Active on the Nexus 7 you need to first unlock the boot loader. How this is done is, e.g., explained here. Note that you need the fastboot tool that is mentioned in that link also at least for flashing the MOSLO to the Nexus 7. We assume that you know how to get the required tools for your desktop operating system. After you unlocked the bootloader you need to reboot and keep the volume down key pressed. You should see the Nexus 7 bootloader showing “Start”. We assume that you already extracted the”moslo-nexus7-*.tar.gz” and know where the relevant files are. Furthermore, note that this is an exemplary kernel command line. You could also specify options like “fbcon=rotate:1” for rotating the kernel output into landscape or “quiet” for suppressing kernel output. For the first tests it is strongly suggested to keep the kernel command line as-is. When flashing of the MOSLO succeeded keep the Nexus 7 connected to your computer and press the power button in order to boot into MOSLO. With the Nexus 7 connected to your computer via USB, MOSLO should automatically export the userdata partition as USB storage device. You can check, e.g., via “dmesg” that a new USB device showed up. # /dev/sdX is where the exported userdata partition showed up. That’s it. Next is to reboot into your Plasma Active installation. In order to boot into Plasma Active simply detach the Nexus 7 from your computer by pulling the USB cable. MOSLO should detect this and initiate the kexec hardboot procedure. You should see a notice that the device will reboot in 5 seconds. Do not press any key during reboot. The device then reboots and the same bootloader “Start” screen should appear as at the beginning. This time simply press the power key. Your Nexus 7 should now boot into Plasma Active. Please note that I could successfully test this procedure with the 8GB model. However, it failed with the 3G 32GB model. # For the non-3G models X is 9. # For the 3G model X is 10. Note that when you reboot Plasma Active your device will reboot twice. At first the MOSLO will be booted which then performs a kexec hardboot and reboots into the actual Plasma Active. You can re-install the MOSLO at any time later without any problem. You can also temporarily boot into MOSLO by following the MOSLO installation instructions above and leaving out “flash:raw”. We hope that you like our “small Christmas present”. 😉 We had very much fun hacking on the hardware-adaptation and will continue our work to make Plasma Active run even better on Nexus 7. 🙂 We will also update the Mer Wiki with more detailed instructions for running Plasma Active on Nexus 7. This entry was posted in Announcements, Misc., Snippets and tagged Google Nexus 7, Mer, Open Source, planetkde, Plasma Active. Bookmark the permalink. Is it possible to make it work with current Nexus 7 mutlibooting solution – http://forum.xda-developers.com/showthread.php?t=2011403? It would be nice to have an option to switch between Plasma Active, Android and (K)Ubuntu. This should be possible. I am actually using the kexec hardboot patches from Tassadar (He is the multiboot developer afaik.). The only thing you would need to do is load the correct kernel and pass the correct kernel command line options. Sorry, I accidently posted this two times as I thought the first wasn’t sent, thank you for answer. Also thank you for yout work. Ah, yes, don’t worry. I think the default setting for the blog is that I need to manually approve posts before they appear. So, if someone else writes a post that does not appear straight away, this is most likely because the post is held back by wordpress and I need to approve it first. how do you do this? pass the correct kernel and command line options? Is it possible to make it work with this Nexus 7 multibooting solution: http://forum.xda-developers.com/showthread.php?t=2011403? It would be great to have an option to have Plasma Active, Android and (K)Ubuntu on the same time. See my answer to Squarex above. With make_ext4fs tool from android-tools-fsutils package one can create a user data tarball that can be flashed onto userdata. The ability to override kernel parameters is interesting. Did you use stock Nexus7 kernel? is that available for download somewhere? The problem with “directly” flashing images generated with make_ext4fs via fastboot is that, afaik, you are limited to ~700MB in size. You can actually create bigger file systems by using sparse images but the “payload” contained in the image is limited in size. Another problem is that you cannot read from the userdata partition that way (e.g., to read a log when X did not start properly etc.). Furthermore, in order to modify just one file (e.g., a config file beneath /etc) you would need to reflash the entire partition. The nice thing about the Nexus 7 MOSLO is that it provides “raw” access to the userdata partition. You can even format the partition that way. Also hacking and development can be pretty much sped up by having direct access to the userdata partition without needing a “full” OS. Furthermore, MOSLO allows to login via telnet so you can do much more things. The same warnings about warranty loss, destroying your device or even worse apply here as well. Now I can buy the nexus 7! Does the GPS get picked up in Plasma Active? What’s the password for ssh session? For some reason, I get a connection reset with PuTTY on Windows after I enter my password. I had the same issue with Ubuntu. Anyone know what’s going on? Great to see Plasma Active on a tablet. Where come the packages from for the image? It’s mentioned at the top. To see where the individual packages are coming from see the .ks file. Again, have a look at the .ks file for details like what the respective projects are. * System settings only has three options, Screen Power, Web, and Time. * Some apps wont kick start from Activity Screen wigit. It loads up KWrite. I really want to stay with Plasma Active, but it’s problems on the Nexus really need resolving fast. Very impressed with the Plasma Active concept. * Plasma Active ignores your power settings, and turns off the screen in minutes. Suspends ssh session in the process. please try to contact the plasma active team with your suggestions and issues, just drop an email on the mailinglist active@kde.org. you might also fill out some bugreports on bugs.kde.org. * Dolphin really lacking. No settings. * Most apps/widgets don’t have settings. Thanks for your porting efforts, I’m going to give this a try soon. Where should one report bugs for this adaptation by the way? KDE or Mer bugzilla? That’s a good question and sometimes not so easy to determine. As a rule of thumb: everything that’s specific to Plasma Active should go to the KDE bugzilla and everything related to the hardware-adaptation should go to Mer bugzilla. IIrc there is an “active” (or something similar) component in the KDE bugzilla, specifically intended for bugs in Plasma Active. I think most of of the problems are related to this project not the Plasma-Active one in general as when you observe the Plasma Active 3 demo it works as it should. Other points are gripes or wish list. Then please report them to Mer bugzilla, in order to keep track of these issues. Since there can be a lot of issues. Sorry, you can ignore this. Opentablets site is being decommissioned soon. Could you please point out what a MOSLO is? In a nutshell, it is an initrd that contains busybox along with some other stuff like kexec tools. MOSLO offers functionality like exporting the “rootfs partition” (which may be different for different devices), USB networking for logging in via telnet, or (at least rudimentary) multiboot support via kexec. I tried to roughly categorise them to HA vs. PA. Feel free to comment and edit. Also on clear issues bug reports should be filed against PA or the HA. For discussions #mer and #active @ freenode are good places. I know the multiboot topic has been brought up, but I am sure more would be able to test and bug hunt if it were made capable of being installed (or just booted) through multiboot to a usb storage device. Alot easier to test when not having to give up a functional system. Personally, I multiboot from an external hdd already formatted to ext4, in addition to the normal internal memory. Currently, the hdd holds 1 android and ubuntu. Others are doing the same, but from a high speed pen drive. If there were a way to install this to the hdd or pen drive (even if from the pc) without needing fastboot as not to use the internal memory, I would be all over it. I can manually drop the root fs on the drive and multiboot sees it there, but of course wont allow boot due to not knowing how to flash the boot to it without fastboot. Any way that could be worked out? The ability of multiboot to boot roms from usb devices could be a huge help in advancing this rom at a much quicker pace. Thanks for listening. Disregard my above statement. I think it wise that poeple like me are better to wait until this progresses enough to have something a little more practical, such as ubuntu’s simpler “userdata.img” flashable, without the additional complications and kernel already bundled. Thanks for your work, at any rate. Wow this is super exciting! We’re talking about this, right? I’m hoping to get one of these for the holidays; voiding my warranty sounds about right. I hope the mentioned bugs get some attention and everything gets working tip-top soon! Well done devs. Mer, huh. I can’t find much about it’s package management, just the convoluted history of mobile OSes that merge and fork. Does Mer use deb packages and aptitude? or are we stuck on rpms still? is there a GUI package manager? Personally, I was also sceptic having to learn a new way for packaging things but as it turns out the way rpms are created for Mer is really convenient and very much straight forward once you got used to it. Especially the “spectacle” tool (“specify”) can help a lot in the daily tasks of creating and maintaining packages. Is there any other repositories? What’s the time line for repair? The system isn’t far off from full compatibility with Plasma Active 3.expectations. Sound and Video codecs are probably the hard stage. There’s no updates in the repository. Are you actively working on this or should we go back to Android till there’s a working image? I really want to use Plasma Active but this release is very broken. * No video play. Codecs? If pdf’s loaded I probably could use this whilst waiting for patches. For me the boot failed altogether on Nexus 32 GB (regular WiFi edition, no 3G). What kind of Nexus do you have? Did extracting the rootfs work? Turn the device on with “volume down” key pressed. Wait for the bootloader to show “Start”. Connect the nexus to a PC via USB. Note that partition number “9” should be specific to the non-3g models. For the 3g models it should be “10”. With respect to the keyboard problem: could you give the custom keyboard I made some time ago a try? Yeah the Keyboard dis now fixed!!!! Also patched and sound is now working, but audio files fail in player. This maybe caused by the references to the default installed media files being broken. Keep up the fixes!!! I can see myself using Plasma Active as main tablet OS if it’s all working. Could you try to touch the display a few times while the UI (with the gray patterned background and the progress indicator) starts up? That seems to work. I used it for about an hr. Some black screen locks during use, things seem to get slow after a while but it works. Install process was easy enough so I’ll keep flashing the new builds. (moslo is great!) Typing in settings windows is very hit and miss. I find if the screen goes black when booting, it comes to life if you plug the usb power in. Note you aren’t supposed to have the usb connected on boot, else MOSLO will stick, or you maybe taken to a recovery level, like CWMR. Is Vivaldi initiative completely dead? Sound is now working !!! Yes, I just noticed that sound started to work (I’m not sure what was updated, I run zypper refresh && zypper update in between). The link don’t work for me. I just put some video files in the home directory. Same but nothing works. Tried installing dragon player to see if alternative player would work but no luck. > The link don’t work for me. “DISPLAY=:0” is only needed when you run this via an SSH session btw. Yesterday, I already got hardware-accelerated playback for mp4 videos working with the integrated media player (bangarang). Hopefully, I can publish another update today that adds this functionality. Edit: I just saw, shmerls version should work with sound while the shortcut I posted above just displays video. The fix for the internal player I mentioned will of course show videos with sound. you should get hw-accelerated video playback with bangarang. I tested this yesterday for at least mp4 and divx (with the sintel trailers). With this you can run Nemo apps on Plasma Active. This gives you access to much more nice, touch-optimized apps. See also my other posts about this. It would be nice to get this working with MultiROM (http://forum.xda-developers.com/showthread.php?t=2011403). Right now it’s very hard-coded for the way Ubuntu and Android do things, so it doesn’t work with this. The main idea of MultiROM booting from internal storage is using something like /data/media/0/multirom/roms/plasma/root as the root filesystem instead of just /data. This is accomplished in Ubuntu by modifying it’s initramfs scripts to look for a “rootsubdir” parameter in the kernel command line. If found, it will be used as a chroot after mounting /. There’s other things like booting from USB (including .img files on NTFS and FAT partitions) that require other tools (like ntfs3g) in Ubuntu’s initramfs. As far as I can tell, there’s no real standard way of doing initramfs on mer? Yeah, not standard way of doing initramfs on Mer. What file system is the usable partition (/data, /sdcard)? Maybe booting from a .img would be convenient option. The /data partition is ext4. Wouldn’t booting from a .img need an initramfs as well? Using usb charger immediately makes the nexus suspend. Locks the screen over and over trying to sleep until you take it out. I have to charge by shutting down first. I found it somewhat random. At times you can have a charger plugged in and still being able to work with the tablet. But it does randomly attempt to lock and put it to sleep indeed in such case. What I found strange is, that even with the plugged in charger, the energy level goes down when you work (though probably slower). It only goes up when the screen is off. Is it normal? The screen has always been the biggest source of power drain for me with android or plasma active. Maybe power management is forcing the sleep as I can’t use any of my chargers while started. I always charge with the device being on. After plugging the charger in the lock-screen is displayed. The display turns off after some time. Also note that after unplugging and un-locking the screen, the battery indicator may still show the old state for a while, i.e., the indicator may report the battery as empty while it is actually full. This works pretty well for me. But I don’t use the device while charging. What is the status of booting a 32G device? Does anyone know what GPS the device has (ie, is there a possible gpsd/qtmobility driver)? 32 GB device WiFi only (no 3G) version has some issue with booting from Moslo (it reboots extra time), but if you use the direct method removing Moslo (as described above) – it boots well. I didn’t test the 3G version of the device though. Same holds for the 3G version. How is wifi working? My understanding is you have to use a proprietary driver for this which comes from I believe either bcom or qcom and they have to license it to you? Wifi works fine. With respect to the driver: it uses the bcmdhd driver from Broadcom which is part of the Linux kernel (CONFIG_BCMDHD). By the way, we use the same kernel as the Ubuntu “hw-adaptation” for Nexus 7. With respect to licensing: my understanding is that the driver is licensed under the terms of the GPLv2 (see, e.g., https://android.googlesource.com/kernel/tegra/+/a457025441793d5488fb4173aa48fd1497fd1cdb/drivers/net/wireless/bcmdhd/hndpmu.c). They don’t use the GPLv2 directly but use it as a “fallback” or “catchall”. Plus, they have some custom additions to it. For us, however, my understanding is that, it effectively boils down to GPLv2. According to some sources (e.g., http://nexus7manual.com/ http://www.ubmtechinsights.com/google-nexus-7-teardown/) it is the bcm4751 Broadcom chip. There seem to have been also an attempt of opensourceing a driver for Linux (https://groups.google.com/forum/?fromgroups=#!topic/linux.kernel/W2mZJcakRmI). Unfortunately, this driver uses a proprietary protocol. I also tried to patch our Nexus 7 kernel to include this driver. It loads but doesn’t seem to find a device/chip. Generally, if you have information about chips being used etc. We would highly appreciate if you (a general “you” as in “you all” ;)) could send us this information, or even better, post links to it. I’ve got Mer/Plasma Active dual boot with Android/Cyanogenmod 10.1 on my nexus7 , simply flash the MOSLO kernel to recovery instead to boot and ready . How did you do this? Just copied the filesystem to /data? * The list of running programs exhibits odd display artifacts. See http://i.imgur.com/vH3ib.jpg. Closed applications leave their “X” and some text garbage. * Even with “Lock screen” off, “Turn off the screen” set to 60 minutes, and “Sleep” set to 60 minutes, the display goes dark after a couple minutes. If I wait a bit longer, I hear th KDE tune that’s associated with unplugging the AC adapter from a laptop. One time, after waking the tablet, it emitted a very high pitch squeal from the speaker. I had to launch Phonon to make it stop. * The Maliit keyboard seems more responsive, but the alignment is off — the middle row needs moved over to the right a bit; the “A” shouldn’t be left of the “Q.” Backspace should be in the top row. * When I boot the device, MOSLO starts (if I’m interpreting the sequence correctly — Mer is unfamiliar to me). Then the device reboots, and rather than Plasma booting, the device boots into recovery (I use TWRP). I have to exit recovery into the bootloader, then press the power button. Plasma boots after this. How can I skip the boot-into-recovery step? Ah, can’t believe I missed that. Thanks. Ruedi can you do blog entries telling people what’s new in your Plasma active image works? Like give a run down of change each update. i think that putting this installation guide on the mer and/or kde wiki would be usefull. do i get your permission to copy parts of your blogpost for that? I second what Tuomas said. It’s always good to have some better maintained documentation than just a single blog post. 🙂 Feel free to copy&paste the instructions etc. found here to the wiki. PS: I was a little busy with other things lately so I didn’t have the time to respond to all requests. Hence, some requests might have slipped my attention. I hope to find some time this weekend to make this a little more useful. Feel free to contact me if I should try out something else on my device. Is development of the project still active?? Is this project still in active development?? Plasma Active itself of course is in active development. As is the Nexus 7 hardware adaptation as well. If you look, e.g., at the posts tagges with “Google Nexus 7” here you will see that there is quite some progress with respect to the hardware adaptation. For more information about Plasma Active please have a look in the respective official websites. Things are not going well for me. There were no problems to unlock the bootloader and no problems to flash MOSLO using fastboot. No problems to create a ext4 file system and extract the moslo-nexus7-*.tar.gz either. After these steps, things are not going my way however and I don’t know if I am doing something wrong or what is going on. Everything should be mounted now. No rootfs image found. Doing nothing. Unable to load AlternateOS kernel. I also have another problem. After I flashed MOSLO onto the unit, it is impossible to power it off. It will restart regardless. This has drained my battery and it is now empty. The battery seems to charge when the unit is completely dead and then it starts up automatically and runs for about 5 minutes until it runs out of battery again and shuts down. This is repeating in an endless loop. How can I get out of this loop so I can properly charge the battery? My Nexus7 is a 16GB one (no 3G). I finally found out how to power off the tablet so now I am charging it. The first problem remains though. boot into the MOSLO kernel as described above. I experienced the same problem with the 32 GB version, booted into moslo and it worked. If I run the: fastboot -c “root=/dev/mmcblk0p9 ro console=tty1 rootwait rootfstype=ext4” boot zImage-moslo, it says that it wants to reboot after a while. If I keep the USB cable in it, then it just makes the partition available on my computer after the reboot and stops there. If I unplug the USB cable after it wants to reboot but before it has done it, then I just run into the same problem as I originally wrote in my post. Ok I’ve returned and installed the latest image as of 17th Feb 2013, “plasma-active-nexus7-testing-mer-latest-2013-01-07”. I must say things have vastly improved. I will write a list of problems, and hope someone can take them to the appropriate area for fixing. Currently patching. Doing this before I make any real complaints. I’ll have to switch to that image as well. After manually switching to devel branch (it’s newer than testing) my system constantly produces core dumps. PA lack intuitive navigation for going ‘back’ to last app or last page. Pinch zoom is rarely used. Icons are too small with no settings options for appearance or themes. The on-screen keyboard is has no copy/paste feature and no buttons for coders, like Cntrl or Esc. Text fields don’t have context menus for cut/copy/paste The keys are small on keyboard. Bugs and problems cripple the want to use this platform. Out of 10, Score 5. Comment: Lots of promise if it can be included quickly. I fathom the File Browser is a file-type based browser so having a network option maybe troublesome as the files would need to be hashed or examined. Maybe merge the File Browser with Dolphin so one can do conventional file manipulation and also display file-types. That way you can make dolphin an defacto install. I just tried the latest image and I can’t add a wifi connection – it gives insufficient privileges. Also su – doesn’t work with mer password anymore. Same here, using the testing release, any way u fix it ? I tried on a nexus 7 3g 32 gb. its works, but my nexus start, resrart then in recovery mode, then after reboot to plasma. How can u fix this? I installed it on my old, broken Nexus 7 16G. Though MOSLO booted CWM Recovery rather than Plasma Active, “force-loading” it worked fine. Unfortunately it won’t be of much use for me atm, because the touchscreen is unresponsive for 90% (hardware issue, not a software issue), and connecting a mouse over OTG doesn’t seem to work. Ahwell, it was fun installing Plasma Active, and watching it boot. After “zypper up” the metworkmanager not started. How to solve this problem? Thanks. Fortunately the update enable usb0 networking so I can ssh into the device still. Are there any other virtual keyboards that can be installed? So I was unable to connect a BT keyboard and I was unable to get the network up and running. Maybe I buy an adapter and try a usb keyboard but for now I simply switch back to android. It seems that I was simply unlucky yesterday. I tried it again this morning and this time I was able to enter the password of my wifi connection. Also one possibility that I didn’t see yesterday: There is a network connection through the usb cable. I could have configured that to grant the device network access. So far it looks good and I cannot wait to test it fully. With respect to bluetooth: try to install the nexus7-fw-installer package via zypper and follow the instructions. The virtual keyboard is still buggy here, cant type in anything in the network manager. BTW: Is developement still alive? 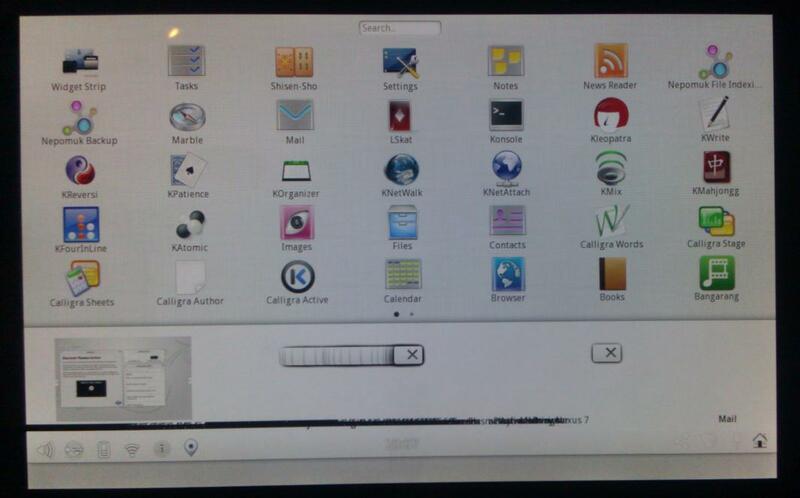 Will there be a version KDE Plasma 4 for nexus 7 ??? It sould better be, Will there be a realese using Plasma Active 4 for nexus 7 ? PLEASE continue your work on adapting the Nexus tablet(s) to Plasma Active! I have been waiting for more than 3 years for a Linux tablet that runs KDE, and your work looks like the most promising BY FAR. THANK YOU very, very much for your effort and time adapting the Nexus tablet(s) to Plasma Active! If you have a mailing list that can keep me updated on your progress adapting the Nexus tablet(s) to Plasma Active, please sign me up. If you are looking for a mailing list, you might want to check at kde.org or plasma-active.org for more information. There is, e.g., the active@kde.org mailing list but there are also other communication channels such as IRC (#active @freenode). Großartig! Nach so etwas habe ich sehr sehr lange gesucht! Vielen Dank dafür und bitte sehr gerne weitermachen! Funktioniert das auch bei dem 2013 Nexus 7 – Model? Funktioniert nur WLAN oder gibt es auch die Möglichkeit sich über UMTS/LTE zu verbinden? Gibt es Neuerungen bezüglich der 32 GB Version? Funktioniert es jetzt mit dieser auch? “Great! After something I’ve searched for a very long time! Thank you and please carry on very much! Does this also work with the Nexus 7 2013 – Model? Works only wireless or is there the possibility to connect via UMTS / LTE? Are there innovations with respect to the 32 GB version? Does it work now with this also? Hi and thank you for all the efforts! I am new to nexus/mer/plasma active etc. but I like to explore a bit. And yes, I know, i am sort of late to the show, but i followed the general steps here and I pretty much encountered most of the issues mentioned above. One question to the MakePlayLive and add on management: this service is down, right? What would be the best way to find suitable addons and, a new/ bigger keyboard?